The Boulder City Review received the Nevada Press Association’s top award for general excellence in its 2018 Better Newspaper Contest. Boulder City Review Reporter Celia Shortt Goodyear, left, and Editor Hali Bernstein Saylor show off a few of the 20 awards they and staff from the Boulder City Review won at the 2018 Better Newspaper Contest presented by the Nevada Press Association on Saturday, Sept. 29, 2018, at the Palace Station in Las Vegas. 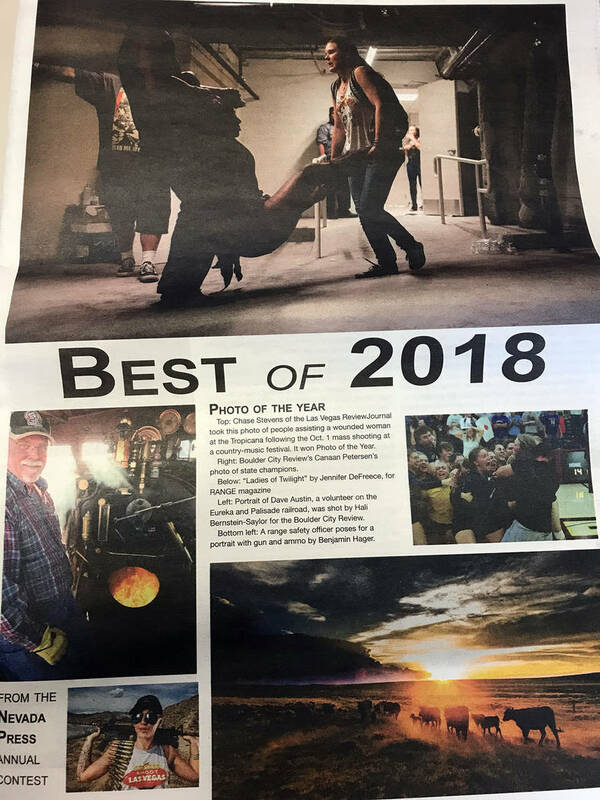 Hali Bernstein Saylor/Boulder City Review The Best of 2018 listing award winners in the 2018 Better Newspaper Contest presented by the Nevada Press Association features two top photos from Boulder City Review staff members on the cover. 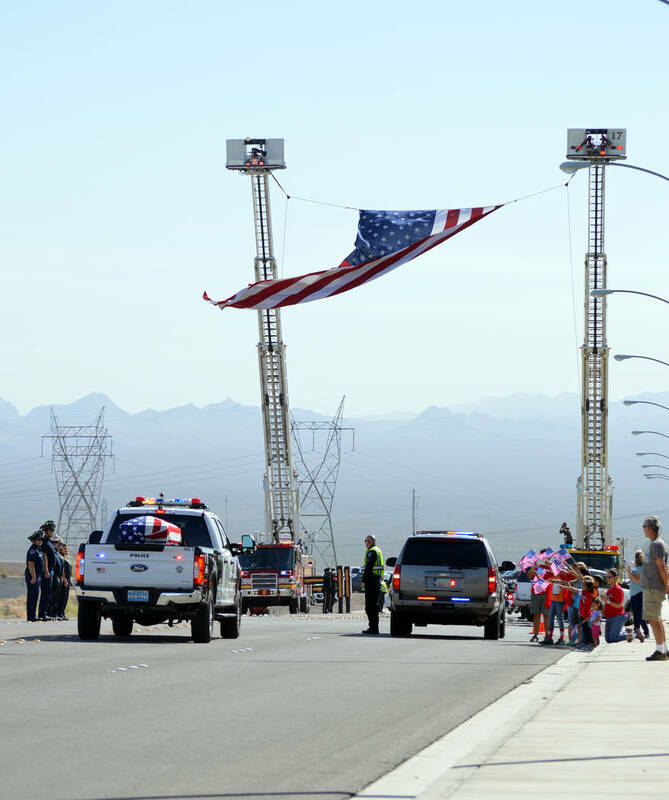 File This photo by Celia Shortt Goodyear of the body of Metropolitan Police Officer Charleston Hartfield, a victim of the Oct. 1 mass shooting at the Route 91 Harvest country music festival, being escorted by law enforcement officers to the Southern Nevada Veterans Memorial Cemetery, won first place for best news photo coverage in the 2018 Better Newspaper Contest presented by the Nevada Press Association. 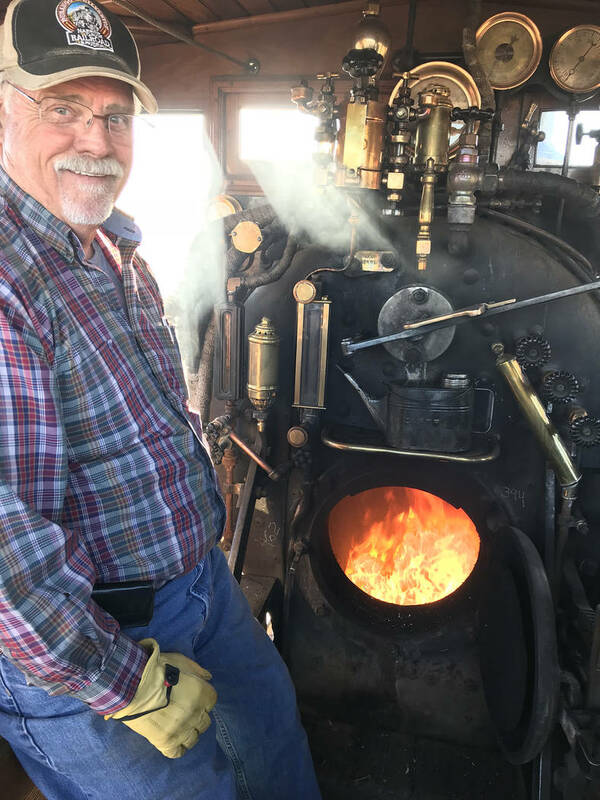 File Editor Hali Bernstein Saylor's picture of Dave Austin, a volunteer fire man for the Eureka and Palisade locomotive, won best portrait Saturday, Sept. 29, 2018, in the Nevada Press Association's 2018 Better Newspaper Contest. File This photo of Boulder City High School's girls varsity volleyball team celebrating their state championship win, taken by former Boulder City High School yearbook adviser Canaan Peterson, won first place for Best sports photo at Saturday's, Sept. 29, 2018, Nevada Press Association's 2018 Better Newspaper Contest. Overall, the paper and its staff earned 20 awards: eight first-place honors, six second-place honors and six third-place honors in its circulation division. The awards were presented Saturday night during the association’s annual awards banquet at Palace Station in Las Vegas. Bernstein Saylor earned four first-place awards, including the top honor for best breaking news story, which was shared with reporter Celia Shortt Goodyear for their story about city Administrative Assistant Bryce Boldt admitting to an ethics violation. “Being recognized by the Nevada Press Association is truly an honor. These awards are some of the first of my career, and I’m so thankful for this opportunity to showcase the quality journalism in Nevada,” said Shortt Goodyear. Bernstein Saylor’s other first-place honors were for best news feature for her story about Boulder City’s new mounted police unit and best portrait for her photo of Dave Austin, a volunteer engineer on the Eureka and Palisade steam locomotive. She also won first and third place in the combined community and intermediate divisions for headline writing. Judges said her word play pushed her entries over the top in this category. “Lots of clever use of words and puns — laugh out loud funny,” they wrote. Shortt Goodyear won a first-place honor for best news photo for her photograph of the tribute to slain Metropolitan Police Department officer Charleston Hartfield, who was killed Oct. 1 during the Route 91 Harvest country music festival. “A good read with immediate impact,” the judges wrote about her photo. The Boulder City Review swept that category, with contributor Paul Luisi taking second place for his photo of Air Force One arriving at McCarran International Airport after the October mass shooting and Bernstein Saylor earning third place for her photo of the solar eclipse viewing event at Lake Mead National Recreation Area. Page Designer Pam Killinsworth, who works in the Las Vegas office, received first place for best overall design of the paper. 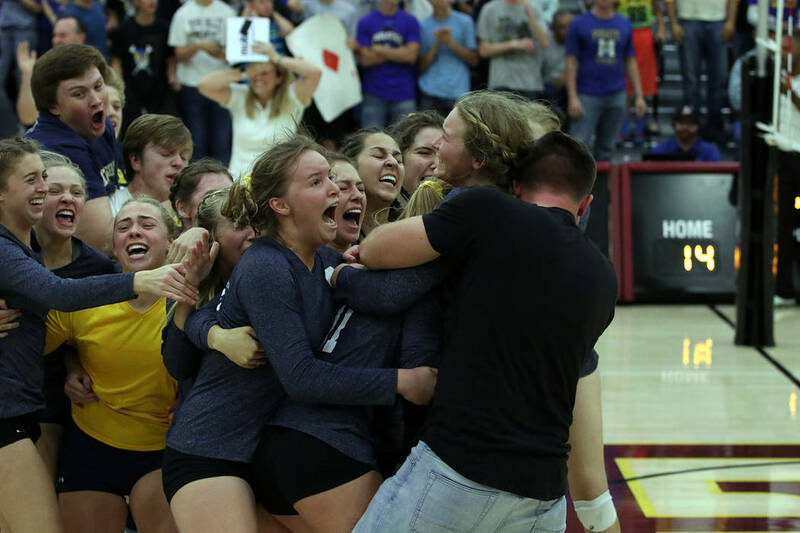 A photo of Boulder City High School’s girls volleyball team winning the state championship taken by former BCHS teacher and yearbook adviser Canaan Petersen won first place as the best sports photo. Bernstein Saylor won second-place awards for best local column, best portrait for her picture of Boulder City Police officer Scott Pastore and his horse Odie and best feature writing for her piece about 96-year-old Virginia Mahaney’s motorcycle ride. Shortt Goodyear won a second-place award for best investigative story for her article about the city possibly flouting its own code. “Great work on this story of enormous importance to the community, from a financial perspective and otherwise,” the judges wrote. Third-place awards were presented to Bernstein Saylor for best explanatory journalism for her story about the construction of Interstate 11, and to Shortt Goodyear for best news feature story for her article about Boulder City Police officer Tiffany Driscoll’s efforts to save a 1-year-old boy, best feature writing for her article about NASCAR driver Joey Gase who honors local organ donors at each of his races and best business feature for her article about Fisher Space Pen’s sales of pens to raise money to help victims of the Route 91 shooting. The Boulder City Review, along with its parent company, the Las Vegas Review-Journal, and its sister publications, received 128 awards. Members of the Wyoming Press Association judged the contest. There were more than 1,300 entries.